This is really a "mix it till it feels right" recipe. Practice will make perfect! Mix well while mashing hot potatoes. 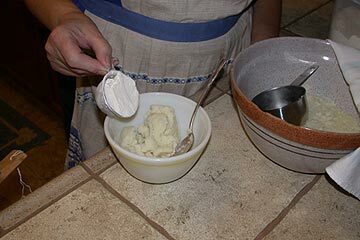 If you use a ricer, you end up with fewer lumps and you want a lump-free mixture. Let cool 2 or 3 hours or overnight, covered with a kitchen towel to prevent a crust from forming. Do not put potato mixture in the refrigerator. It will get too cold and be difficult to handle. 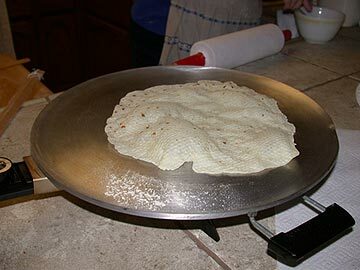 When ready to cook, heat lefse griddle (or ordinary griddle on stovetop) until very hot (475-490 degrees F). After griddle is hot enough, place 3/4 cup potato mixture (enough for 3 lefse, each about the size of an extra-large egg) in a small bowl. Mix with just enough flour to make it easy to handle, about 1/4 cup. 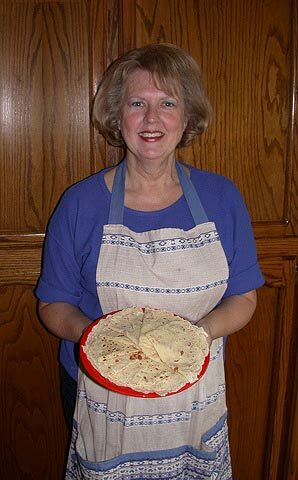 Place another 1/4 cup of flour on the surface where you're going to roll out your lefse. 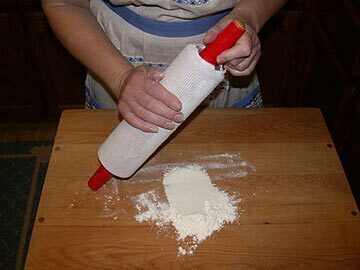 Dust the rolling pin with flour. Take one-third of mixture from small bowl and place in flour on breadboard. 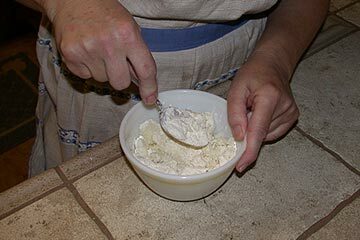 Work enough flour in so you can handle the dough, but not so much that the dough becomes dry. Push most of remaining flour to the edge, out of the way. Starting in the center, roll outward until the lefse is about the size of a dinner plate, mine rarely turn out perfectly round. 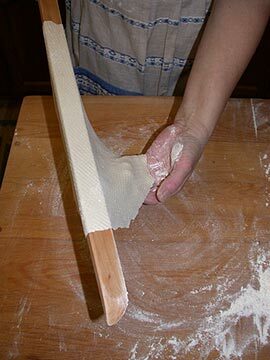 Use a lefse turner to lift the lefse off the board to turn over. Pat the other side of the lefse with more flour to prevent sticking to the board. 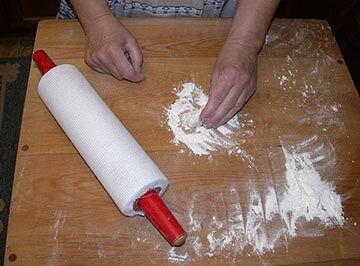 When rolling, lift up the rolling pin as you reach the outer edges. 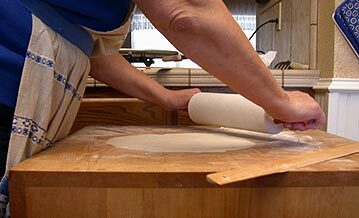 Keep rolling your lefse until it is thin enough, using the fewest rolling strokes as possible for tender lefse. 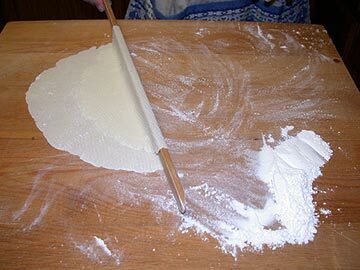 Try not to roll the lefse so thin that you cannot pick it up, but do make it as thin as possible. 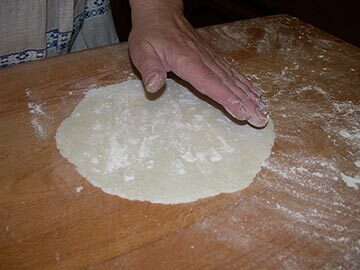 If the lefse tears when you start to pick it up, gather it into a lump and roll it out again. 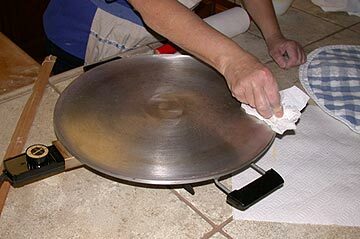 Don't do this too many times, though, or your lefse will end up tough and dry. 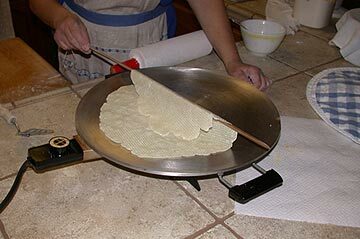 Ideally, you should never wad up and re-roll your lefse, although that's probably not a realistic expectation if you've never made lefse. 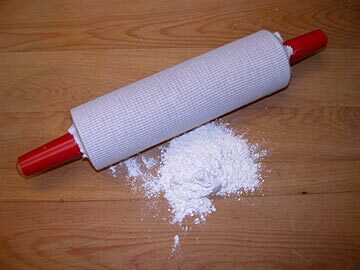 If the lefse starts to stick, add a little more flour. When you have the lefse rolled out, transfer it to the hot griddle. Carefully pick it up and quickly move it. If you move slowly, the lefse is more likely to tear. 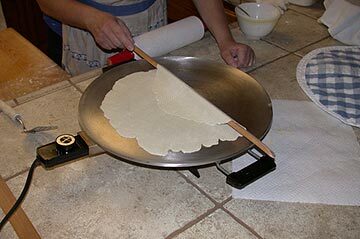 It is easiest to use flat lefse turners (they look like long flat sticks shaped like a very long knife) to transfer the dough by rolling it onto the turner and then unrolling it onto the griddle. 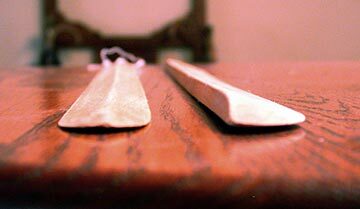 I use a double-edged lefse stick to turn the lefse on the griddle, but the wedge lefse stick is easier to get the lefse off the rolling board. The lefse sticks pictured are ideal, but you cannot buy them. Someone handy at woodworking must make them for you. 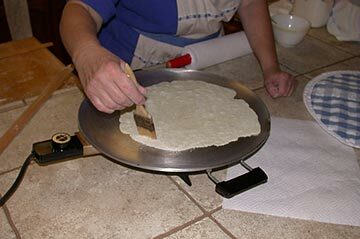 Once you have the lefse on the griddle, bake it for about a minute, just until small bumps like blisters start to appear; then turn the lefse over and let the other side bake just until more bumps start to appear. When turned, the bumps should look like brown freckles on the lefse. 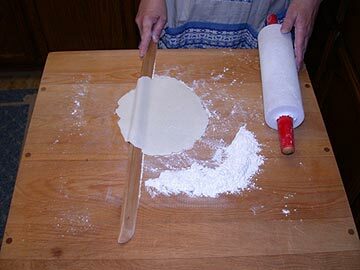 While the first piece of lefse is baking, roll out your second one. Turn the lefse on the griddle with lefse stick. 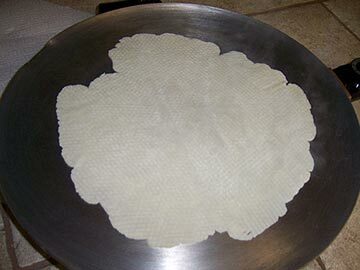 After the first piece of lefse is done, use the lefse stick to remove it from the griddle, fold it in fourths and place it on a clean folded dishtowel. Cover with another folded dishtowel (or a lefse cozy). Bake the second lefse and roll out the third piece. 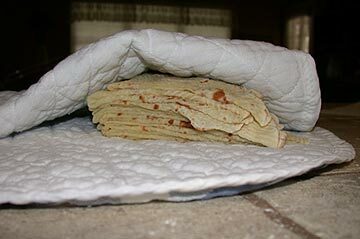 When the second lefse is finished baking, fold it and place it on top of the first one and cover with the towel again. Then bake the third piece. Even if it's not perfectly-shaped, it's still delicious! Repeat with each cup of potato mixture until you have baked all of the dough. 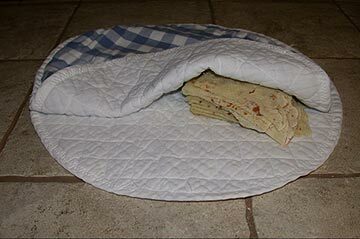 Place each newly baked lefse on top of the previously baked lefse and cover the stack with the towel. 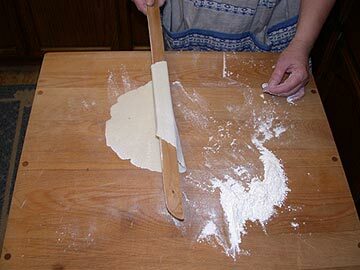 If excess flour is on your lefse on the griddle, sweep it off with a soft pastry brush. 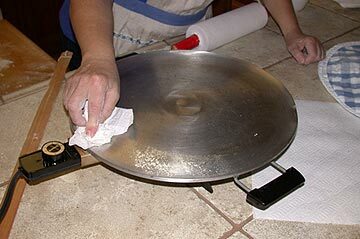 After every lefse, you will need to dust off the griddle. 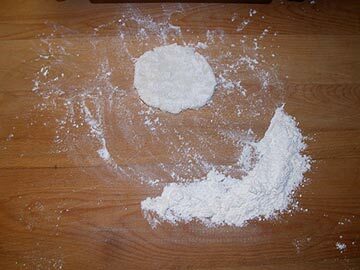 Use a paper towel to wipe off the excess flour through the channel at the side of the griddle. 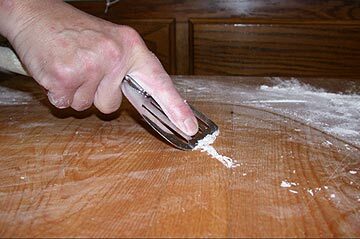 Use a flat-edged metal spatula to scrape the extra potato mixture off your rolling board when the buildup makes your lefse start sticking. If you add flour to the potatoes too soon, the mixture will become runny and will be tough because you have to add too much flour when rolling to be able to handle it. Only add flour to a small amount of potato mixture at a time. Do not grease pan. NO MILK, it makes the lefse tough. To store the lefse, wrap them in a clean dishtowel (flour sack fabric works best), make sure they cool all the way to room temperature, then put the wrapped lefse in Ziploc freezer bags and freeze. 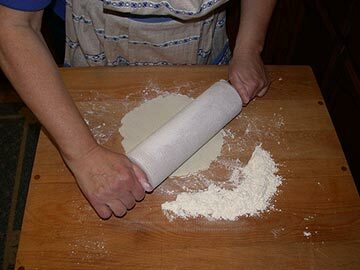 Note: To make good lefse, you need a lefse rolling pin (with grooves) and a lefse stick for turning (like a very long wooden knife). The lefse griddle is optional. 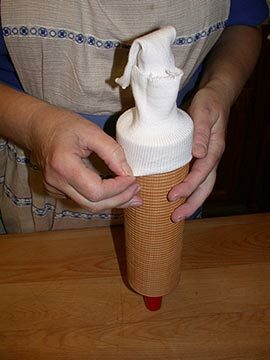 Another item that makes cleanup easier is a stocking* for the rolling pin. I find I can roll the lefse thinner by using a wooden board (mine is a butcher block). I have had no success rolling it out on a cloth covered board--can't get it thin enough. If you really want a lefse griddle, you can find one in Ballard (just north of Seattle) or online at almost any Scandinavian shop. You should be able to get one for $100 or less. They are made by Bethany. 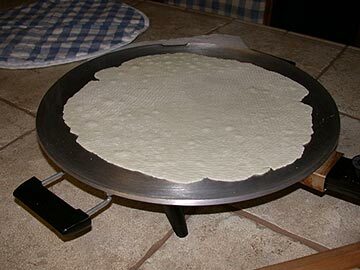 The main advantage to a lefse griddle is that it heats up hotter than regular electric griddles. If you have a gas stove top, you can get the perfect temperature with an ordinary stovetop griddle. Electric stove tops make it a little more difficult, but it can be done. I did it that way for many years. Toppings are personal preference. I prefer butter and sugar, but my husband prefers butter, cinnamon and sugar. I have also seen people eat it like a tortilla with Swedish meatballs in the middle. The strangest combination I have seen is a teenager at church who ate lefse with lutefisk rolled into it. He says that is the only way he has ever eaten lefse. I currently live in California, but I grew up in Edmonds, WA and went to college at Pacific Lutheran University in Tacoma. I have taught several people to make lefse and a group of us get together to make lefse for the holidays early in December. 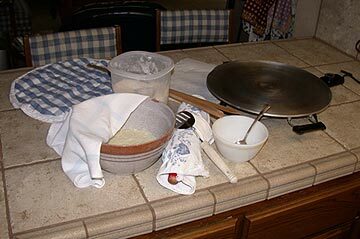 A possibility to learn how to make lefse is to check with your local Sons of Norway group - you could probably find someone who knows how to make lefse there. It is more common at Norwegian meals than Swedish, but I think most Scandinavians love it. If you'd like to ask questions, you can email me (Diane). Good luck and enjoy your lefse!